Every year, the internationally recognized DAH Theatre offers an intensive three-week program of events and practical workshops designed for both actor/performers and directors using contemporary theatre techniques. 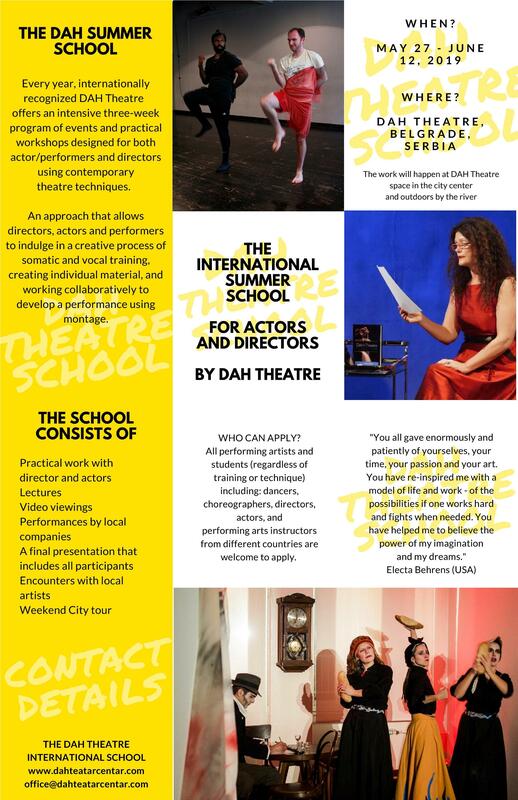 This year, The INTERNATIONAL SCHOOL FOR ACTORS AND DIRECTORS, founded in 2001 is celebrating its 17th summer. Our approach allows directors, actors, and performers to indulge in a creative process of somatic and vocal training, creating individual material, and working collaboratively to develop a performance using montage. The first ten days will focus on the actor-director process, including developing a director’s montage and exploring the actor’s process for their own dramaturgical contributions to the final performance montage. The last five days focuses on personal projects you are currently devising. We offer you our mentorship, assisting you to find how these processes can integrate with the work you wish to do in the future. During this final week, you will work on your own piece with director Dijana Milosevic and other professional DAH Theatre actors. We anticipate that new creative energy might inspire new work and new direction for you and we are happy to assist you in devising a new piece with us. The work will happen at DAH Theatre space in the city center, outdoors by the river, and at Dijana Milosevic’s personal houseboat. Submitted by DAH Teatar on 26 March 2019.